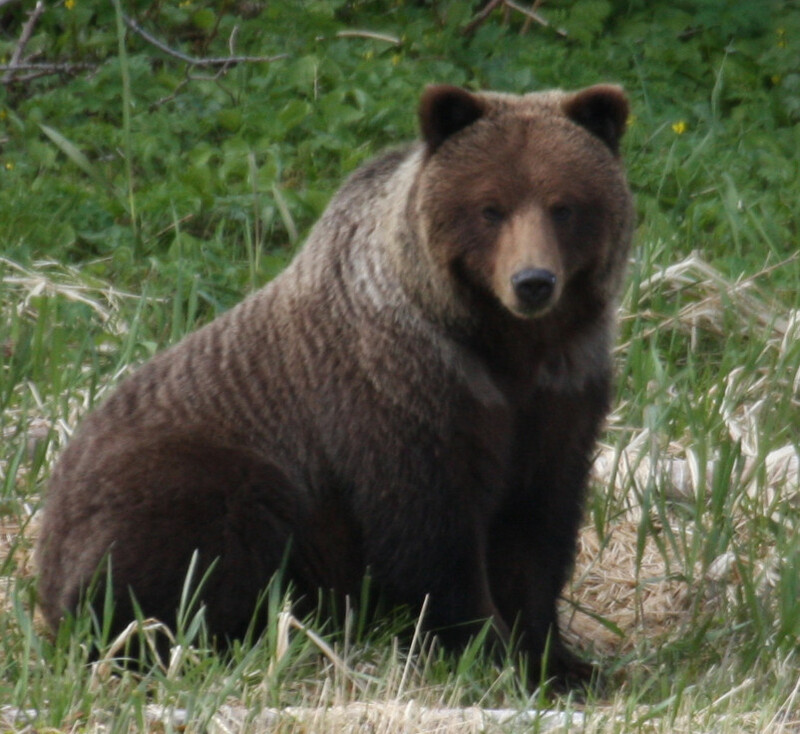 Lituya Bay is a large bay located on the Southeast Alaska coast, about 90 nautical miles SE of Yakutat. The bay is surrounded by very steep terrain with a high potential for landslides and resulting gigantic waves. Some of the landslides are spontaneous and some are caused by earthquakes along the nearby Fairweather Fault, and from time to time boats simply disappear. Notwithstanding the bay's notorious reputation, it's a favorite shelter and anchorage for fishermen (and sailors like me), because of its location along a stretch of coast with no other suitable anchorages for a distance of about 130 nautical miles. 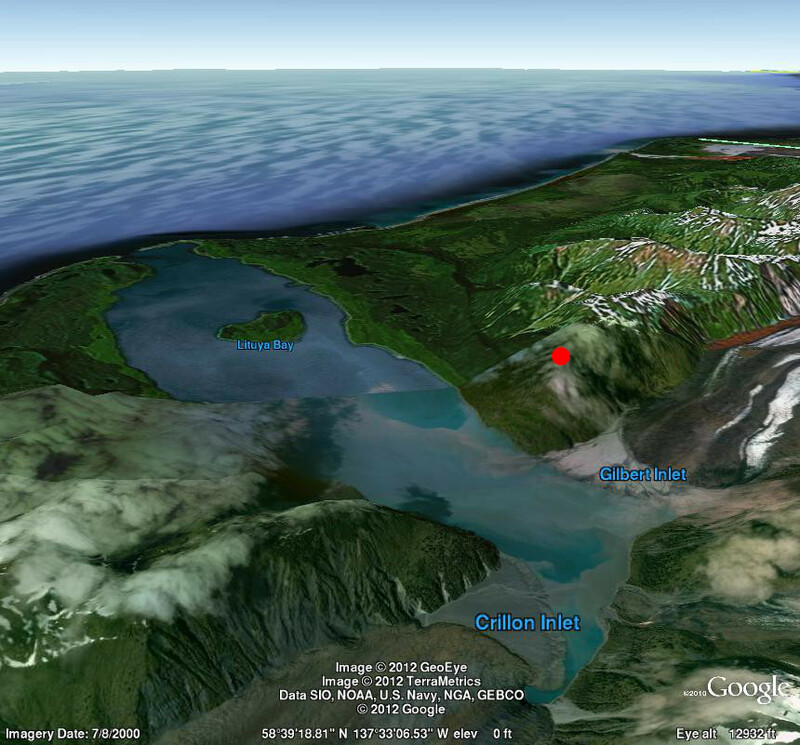 On July 9th, 1958, an earthquake triggered a massive landslide in Gilbert Inlet (see Figure 1). It is estimated that 30 million cubic meters of material fell from higher elevations and displaced the water in Gilbert Inlet, which in turn produced what is now called a "megatsunami", a tsunami with a magnitude and height previously thought impossible. Because of the shape of the bay and landscape, the water in Gilbert Inlet couldn't simply move horizontally away from the landslide material — instead it was forced upward within the confining landscape. At one location, marked with a red dot in Figure 1, the water rose to a height of 1,720 feet (524 meters), stripping away the trees and vegetation along the way (a closeup appears as Figure 4 below). As the massive wave moved away from the head of the bay and occupied more area, its height declined, finally rising "only" 30 feet (9 meters) at the bay's entrance. I visited Lituya Bay twice this year, in May and July, and took pictures as I tried to sort out the details of the 1958 event. While reading about this and other similar events (Lituya Bay has a history of landslides and gigantic waves), I've encountered a number of inaccurate claims in the various articles written on this topic. To solve the comprehension problem, I think eventually someone should take the time to create a scientifically accurate computer simulation (and animation) of the 1958 event to clarify the hydrodynamics in an easily interpreted way. 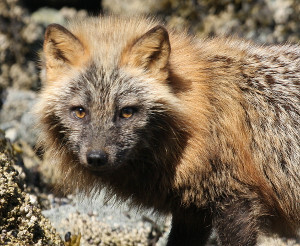 When you first enter Lituya Bay, the first thing you notice is a partition along the shore, at a height of between 30-60 feet (9-18 meters) near the ocean, that separates new and old trees, and that marks where the tsunami stripped away the trees as it moved toward the ocean (Figure 2). In the middle of Lituya Bay is an island, Cenotaph Island, 320 feet (98 meters) in height, on which one can see the demarcation left by the tsunami at about 150 feet (the light-colored vegetation marks the area stripped bare in 1958) (Figure 3). But the most-remarked-on aspect of the 1958 event was the maximum height reached by the tsunami. 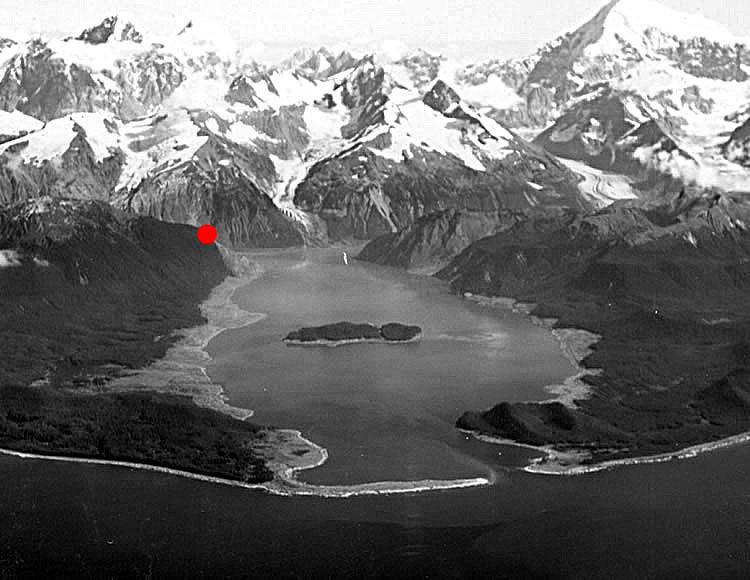 At the head of the bay is a mountain bordering Gilbert Inlet that, because it confined the rapidly moving water, was stripped of vegetation to a height of 1,720 feet (524 meters) (Figure 4, also see the red dot in Figure 1). Lituya Bay is a perfect subject for exploration with Google Earth, for a number of reasons including the fact that the outline of the 1958 land-stripping event is still clearly visible along the shore of the bay (and in Figure 1 on this page). To more clearly show the stripped areas, Figure 5 is a historical aerial photograph taken shortly after the tsunami in 1958. Red dot: high-water mark on "Tsunami mountain"
In the Lituya Bay Wikipedia article, we read, "On July 9, 1958, an earthquake caused a landslide in the Crillon Inlet at the head of the bay". But according to the linked Lituya Bay megatsunami article and the article it sources, the landslide took place in Gilbert Inlet, on the opposite side. In the Lituya Bay Wikipedia article, we also read, "The wave possessed sufficient power to snap off all the trees up to 1,720 feet (520 m) high around the bay." This implies that the entire bay was stripped of vegetation to a height of 1,720 feet, when in fact this height was achieved only at a specific location (see Figures 4 and 5) and for reasons that are obvious, while the heights were much less elsewhere in the bay. Moving on in the same article, we read, "Based on Swanson's description of the length of time it took the wave to reach his boat after overtopping Cenotaph Island near the bay's entrance ...". But the wave didn't "overtop" Cenotaph Island, it denuded the island up to about half its height on the eastern shore and less on the west, as clearly shown in my image in Figure 3 and the historical photo of Figure 5, on this page. Apparently to remind Lituya Bay visitors how dangerous the place is, on June 11th this year, a huge landslide on nearby Lituya Mountain registered seismically as a magnitude-3.4 event (each mangnitude unit in the Richter scale represents an increase of ten times in amplitude), but didn't enter the bay. In an NBC News story about this event, reporter Miguel Llanos provides this bit of background: "In 1958, a nearby landslide, this one above Lituya Bay and triggered by a 7.7 earthquake, created a wave hundreds of feet high that washed 1,720 feet up a narrow inlet [emphasis added]." I guess the actual story was too difficult to understand. The above account only begins to describe Lituya Bay from a historical perspective. It was explored by French explorer La Pérouse in 1786, during which time 21 men were lost trying to map and navigate the bay's treacherous entrance. La Pérouse erected a memorial to his lost crewmen — a "Cenotaph" — on what is now called Cenotaph Island. The Cenotaph included the words, "A l'entrée du port ont péri vingt-un braves marins; qui que vous soyez, mêlez vos larmes aux notres" (At the entrance of this port was lost twenty-one brave sailors; whoever you are, mingle your tears with ours). But the original monument has disappeared, possibly washed away during the 1958 megatsunami, reminding us all that nature is in charge. To any sailors reading this article who might consider visiting Lituya Bay, I have this advice — read the Coast Pilot (chart 16762) before attempting to enter Lituya Bay (key Coast Pilot quote: "Strangers should not attempt to enter except at slack water"). Specifically, pay attention to the strong currents at the entrance and the fact that the current direction is not aligned with the physical entrance, which creates a risk that a boat may be swept diagonally onto rocks regardless of the current direction. Also, on an ebb tide, when the wind and swell come from the southwest as they often do, waves break across and outside the entrance because of opposing wind and current (and see below). In fact, this is thought to be what killed La Pérouse's men — from relatively calm water inside the bay, they were overpowered and swept into a maelstrom just outside. I've been thinking about this for a while now — why don't we have a single word for "opposing wind and current"? We have any number of words available for "drunk" (inebriated, intoxicated, soused, tipsy, three sheets to the wind, etc.). We have at least 20 words for the various forms precipitation might take (rain, sleet, drizzle, mist, torrent, deluge, etc.). Every experienced sailor knows opposing wind and current when they see it, most know what to do (stay away), but there's no English word for it. There are only a few things for which there is no English word — one of them is Schadenfreude (taking pleasure in the misfortunes of others), something Americans seem fond of, and an activity that may eventually become an Olympic event. According to the Schadenfreude article, someone tried to create an English substitute composed of Greek roots, and came up with epichairekakia (ἐπιχαιρεκακία). But you know ... sorry, no sale — apart from being contrived, it substitutes Greek for German, and there's still no English word. Opposing wind and current is something every sailor needs to understand (and most don't understand it at all). When wind opposes moving water, it concentrates the energy of the waves by preventing it (the energy) from freely moving across the water and dissipating along with the waves (remember that waves aren't a distinct physical thing — water is a medium in which waves convey kinetic energy from place to place, not unlike sound wave in air). In the worst case, opposing wind and current causes standing waves that eventually become gigantic, and some believe so-called "rogue waves" are generated over time by opposing wind and current. From the Wikipedia Rogue Wave article: "Rogue waves seem not to have a single distinct cause, but occur where physical factors such as high winds and strong currents cause waves to merge to create a single exceptionally large wave." A phenomenon we all need to understand for safe sailing ... and we don't even have a word for it. So after a few wary looks, I decided not to wander around on the thickly brushed island, looking for artifacts — not wishing to become one myself.